River Valley junior Jared Reese, second from right, takes a handoff during the first quarter of a Week 2 football contest against Gallia Academy at Memorial Field in Gallipolis, Ohio. Last Week: Gallia Academy lost to Jackson 15-9, in Jackson; Chesapeake defeated Symmes Valley 49-0, in Chesapeake. Last meeting between the teams: Sept. 15, 2017. Chesapeake won 34-21 in Gallipolis. GAHS offense last week: 149 rushing yards, 51 passing yards. CHS offense last week: 266 rushing yards, 29 passing yards. GAHS offensive leaders last week: QB Justin McClelland 6-of-11, 51 yards; RB Lane Pullins 18 carries, 70 yards; WR James Armstrong 4 receptions, 31 yards. CHS offensive leaders last week: QB Zander Schmidt 1-of-1, 29 yards, 1TD; RB Donald Richendollar 3 carries, 61 yards, 1TD; WR Ian Hicks 1 reception, 29 yards, 1TD. GAHS defense last week: 143 rushing yards, 43 passing yards. CHS defense last week: 63 rushing yards, 7 passing yards. 1. This is the Ohio Valley Conference opener for both teams. GAHS was 4-3 and finished tied for third in the seven-team league a year ago. The Panthers had just one OVC win last season, defeating South Point to take sixth in the conference standings. 2. These teams have met three times since 2014, with the home team winning on each occasion. 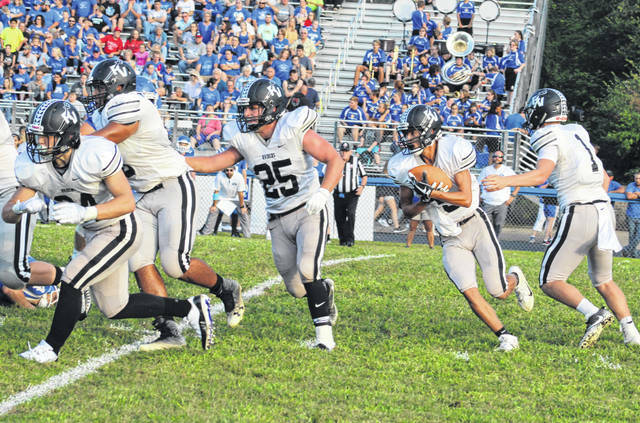 Gallia Academy’s last trip to Chesapeake resulted in a 48-6 Panthers victory, the most lop-sided contest of the trio. 3. Six different Blue Devils have found their way to the end zone this season. In total, the GAHS offense has scored 14 times, 11 of which have come on the ground. The Gallia Academy special teams unit has scored one touchdown, with the Blue Devil defense adding a safety. 4. GAHS is plus-2 in the turnover column through three weeks of play. Gallia Academy’s opponents are 23-of-43 passing this fall, while gaining 17.3 yards per catch. The Blue Devil defense has held foes to 4.8 yards per carry. 5. Gallia Academy was 2-1 in non-conference play this season, giving the Blue Devils their first winning record in non-conference play since 2013. The Blue Devils have outgained their non-conference opponents by a 1,027-to-649 clip, while outscoring them 102-to-49. Last Week: Nelsonville-York lost to Minford 22-6, in Minford; River Valley lost to Portsmouth 35-7, in Bidwell. Last meeting between the teams: Sept. 15, 2017. Nelsonville-York won 49-7 in Bidwell. Current head-to-head streak: Nelsonville-York has won 2 straight. NYHS offense last week: N/A. RVHS offense last week: 123 rushing yards, 16 passing yards. NYHS offensive leaders last week: N/A. RVHS offensive leaders last week: QB Jordan Burns 2-of-10, 16 yards; RB Layne Fitch 7 carries, 58 yards; WR Layne Fitch 2 receptions, 16 yards. RVHS defense last week: 394 rushing yards, 84 passing yards. 1. The Buckeyes have defeated the Raiders in nine of their last 10 meetings, with the lone RVHS victory coming by a 23-12 count on Sept. 18, 2015, at Boston Field. The Buckeyes won their last trip to Bidwell by a 46-6 count, on Sept. 16, 2016. 2. This is the Tri-Valley Conference Ohio Division opener for both teams. NYHS has won back-to-back league titles and enters with a 12-game league winning streak. The Raiders had just one win in the seven-team league last year, and finished sixth in the final standings. 3. River Valley is 0-3 for the first time since 2013, when the Raiders lost their first four. The Buckeyes are off to their first 0-3 start since 2002. NYHS hasn’t began a campaign with four losses this millennium. 4. Through three games, the Raider offense has gained 357 of its 445 total yards on the ground. RVHS is 6-of-22 passing, gaining 14.7 yards per completion, while getting 3.1 yards per carry. 5. The Raider defense has surrendered 18 touchdowns, including 15 on the ground. The RVHS special teams unit has also let one returner get past it for six points this year. Last Week: Trimble defeated Eastern 35-0, in Tuppers Plains; South Gallia defeated Federal Hocking 47-6, in Stewart. Last meeting between the teams: Sept. 8, 2017. Trimble won 51-3, in Glouster. Current head-to-head streak: Trimble has won 8 straight. THS offense last week: 207 rushing yards, 132 passing yards. SGHS offense last week: 437 rushing yards, 96 passing yards. THS offensive leaders last week: QB Cameron Kittle 7-of-14, 94 yards, TD; RB Conner Wright 12 carries, 123 yards, TD; WR Austin Wisor 4 receptions, 32 yards. SGHS offensive leaders last week: QB Tristan Saber 7-of-12, 96 yards, 1TD; RB Jeffrey Sheets 6 carries, 140 yards, 2TDs; WR Jeffrey Sheets 3 receptions, 59 yards. THS defense last week: 112 rushing yards, 21 passing yards. SGHS defense last week: 76 rushing yards, 33 passing yards. 1. In the previous eight meetings between these teams, THS has outscored the Rebels by a 374-69 total. SGHS has never scored more than 14 against the Tomcats. Trimble’s last trip to Mercerville was on Sept. 9, 2016, and resulted in a 42-0 THS victory. 2. The Rebels ended an 8-game skid in a big way last week. The 41-point margin of victory is South Gallia’s biggest since Week 4 of the 2011 season, when the Rebels won by 46 points at Miller. 3. The SGHS offense has gained 910 of its 1,056 yards on the ground, while scoring eight of their nine touchdowns on running plays. South Gallia is 0-2 on running two-point conversion tries, but is 1-for-1 when passing for two points. 4. South Gallia was flagged 20 times last week, totalling 173 yards in penalties. In the Rebels first two games of the season, they were flagged a combined 16 times for 122 yards. 5. Trimble enters with an seven-game Tri-Valley Conference Hocking Division winning streak, as well as a nine-game regular season winning streak. The last Gallia County team to defeat Trimble was North Gallia, which defeated THS 14-7 in 1991.